If you missed any of the action, or need a moment to compose yourself and revisit a specific part of the race, then lap by lap coverage is just what you need. And luckily enough, this Factbyte Factbox replay fits the bill. Sebastian Vettel wins the race after Mercedes bungled pit stop. Hamilton takes penalty for delaying Ricciardo in the pit entry. Both Mercedes drivers finish on the podium with Hamilton ahead of Bottas. Stoffel Vandoorne unable to start race due to McLaren Honda power unit issue. Magnussen and Verstappen both retire with mechanical failures. Stroll and Sainz collide to cause safety car period. Hello F1 friends, you've turned up just in time for the Bahrain Grand Prix, how fortunate! This is the second of back-to-back races, with the Chinese outing just seven days ago. 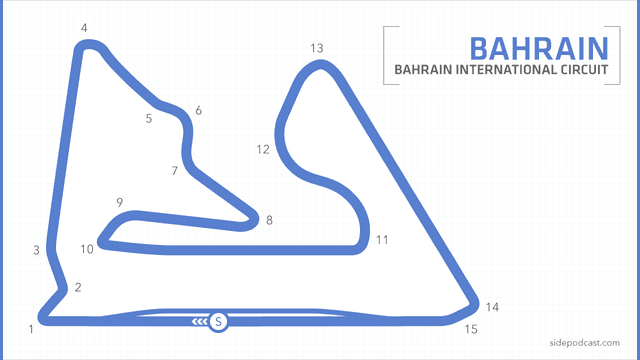 This time, we're in the desert for Bahrain's night race extravaganza. So far this year, we've had Sebastian Vettel winning a race, and Lewis Hamilton taking his turn on the top step of the podium. This weekend so far appears to be leaning more towards Mercedes, but Valtteri Bottas isn't letting Lewis have it all his own way. The Finn sneaked into pole position by less than a tenth of a second yesterday, after a close fight for the first spot on the grid. Renault did well to get both drivers into the top ten, with Jolyon Palmer making his first Q3 appearance ever! Magnussen starts from the very rear of the field. Stoffel Vandoorne and Fernando Alonso are also towards the back of the grid, and it's a surprise to see both the Force India cars down there too, with Esteban Ocon the highest placed in 14th, and Sergio Pérez way down in 18th place. The wind is blowing pretty well at the Sakhir circuit, with Sebastian Vettel getting a warning from his engineer to watch out for it as he makes his way to the grid. The race starts in the daylight but soon the sun will set and the floodlighting will take over. Team radio to Romain Grosjean: "Okay to go to the grid. P9, left hand side." Stoffel Vandoorne appears to have yet more issues on his McLaren, and will either start from the pit lane or not even make the start of the race. Fernando Alonso on the grid: "Stoffel, I understand that he will not even start the race, with engine problems, definitely not the best weekend so far. Hopefully we can do a good start, and we can fight while the car is still alive." Mark Webber managed to extract just a few words from Kimi Räikkönen on the grid: "It’s gonna be a tricky race with all the wind and everything." Tweet from @RenaultSportF1: Jo on the grid. Tweet from @McLarenF1: Sunset is fast approaching. The floodlights are on, the grandstands are filling up. So the national anthems have played and the drivers are now making their way into the cockpits of their various cars. Last minute checks and preparations for everyone, with just under ten minutes to go. Three middle of the road compounds available for drivers today. Pascal Wehrlein qualified in 13th place, a good performance considering he's missed two rounds of the season so far. This will be his debut race for the Sauber team. All drivers look set to start on the supersoft red striped tyres, with only Marcus Ericsson starting on the yellow softs. The grid is clearing, just mechanics left ready to whip off the tyre blankets ahead of the formation lap. Valtteri Bottas leads the field away from his first ever pole position slot, one full formation lap coming right up. It's a lot darker now, with the floodlighting already making a significant difference. Bottas pulls to a stop at the front grid slot and the rest of the field piles in behind, lining up neatly for the start. Hamilton was turned towards Bottas, but moves away from him off the line. Bottas leads cleanly away, as Vettel gets past Hamilton round the first corner. A clean start through the rest of the field and there are sparks flying off the cars already. Räikkönen has dropped two places, whilst behind him cars are running three wide to pick up those last places in the top ten. Vettel is looking racy and clinging to the tail of Bottas during this first lap. The two Toro Rosso drivers are side by side as well, but then Kvyat ran well wide and dropped back down to 18th place. The Mercedes cars now look like they're up to speed, it took them a whole lap to look comfortable. Wehrlein has dropped from his 13th place grid position down to 17th, so a poor start for him there. The top five drivers are all within one second of each other, we're only three laps in but normally field spread would already be hitting. Tweet from @ForceIndiaF1: Busy first lap with both our boys moving forward. Esteban ends lap one in P10 and Sergio up in P13. Both the Ferrari drivers are in the hunt for an overtake, with Vettel close to Bottas but unable to make a move. Räikkönen is fidgeting about behind Massa, looking to regain sixth place. Kimi runs wide on the final corner, kicking up some dust, as he looks for a way past a superbly wide Williams. Team radio to Daniel Ricciardo: "Okay mate, so pace at the front is very stable... it's not really opening up much." Bottas is warned that he's getting a little bit of overheating but nothing significant. He's running in clean air at the front, so that's concerning. Vettel is still within half a second of the race leader but can't find a way past yet. Close up TV shots show the dirty air being thrown off the back of Bottas' Mercedes, but the Ferrari is still there, staying in range. Räikkönen finally gets an opportunity to pass Massa, moving up and alongside down the main straight and taking the position before the first corner. Lance Stroll has come in for an early pit stop, after picking up a flat spot at some point in the opening nine laps. Team radio from Max Verstappen: "We are quicker than them but I get stuck." Yellow flags as Kevin Magnussen has pulled off track and parked up his Haas. More Bottas radio reports that the tyre pressures are higher than anticipated, the engineer says it is a problem but they're aware. Vettel dives in for an early pit stop, sacrificing second place to bolt on another set of supersoft tyres. Because the field is so close together, Vettel has returned in 12th place. Team radio from Verstappen: "I think we need to do something as well, like Ferrari." And as suggested, Verstappen does come into the pit lane for his own super quick stop. More red stripes on the Red Bull. Ocon and Wehrlein have both also come in for pit stops. Tweet from @WilliamsRacing: L11: With the new soft tyres bolted to the car, Lance sets the fastest lap of the race! Max Verstappen has ended up in the barriers. Locked up at the corner on cold tyres, rumbled across the gravel and tapped into the barrier. "Brakes failed, gahhhhh." Verstappen reports. A slower stop for Kimi Räikkönen, who came into the pit lane for his first stop of the day. Verstappen is out of the car, visibly frustrated as he kicks out at the barrier and rips off his gloves in disappointment. Stroll has stopped on track with debris scattered behind him. Sainz is parked up at the side of the road, it looks like he was involved in the Stroll incident. Bottas comes into the pit lane, and Hamilton stacks up behind him. Really slow stop from Mercedes to delay both drivers. Lots of others piling into the pit lane behind, taking the opportunity behind the safety car. Replays show Sainz comes out of the pits and heads straight into the side of Stroll, who didn't appear to know there was a Toro Rosso there. Sainz bashed into the side of the Williams, and both are now out of the race. Pit entry incident involving Lewis Hamilton and Daniel Ricciardo under investigation. The safety car period should have been bad luck for Vettel, as he had just pitted and missed out on the free pit stop. However, as both the Mercedes stops were relatively slow, he might have lucked into retaining the advantage. Replays of the Hamilton/Ricciardo incident show that Hamilton slowed right down and was holding up the Red Bull. Ricciardo tried to go round and of course eventually Hamilton jinked off to his own pit box. Lots of weaving around on track behind the safety car as drivers desperately try to keep temperature in their tyres. Turn 1 incident involving Sainz and Stroll noted. Hamilton just overtook Ricciardo like he was standing still, that work in the pit lane was pointless! Bottas has zoomed up alongside the Ferrari, looking to challenge Vettel for his lead, but he runs wide and has to drop back. Vettel has taken a mini lead now, breaking free by a second. Räikkönen moves past a sliding Ricciardo, it seems the Ferrari pair are really good at warming up their tyres quickly. Team radio to Daniel Ricciardo: "Keep it together, these tyres will come good." 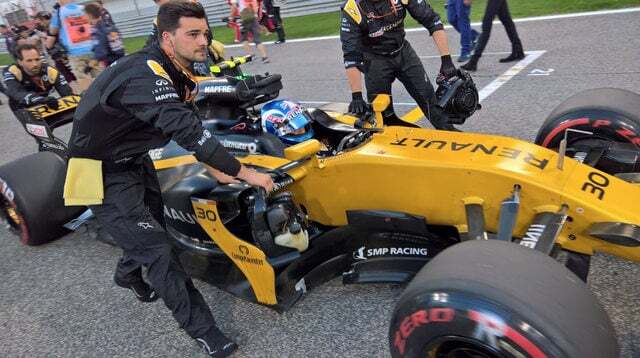 Fernando Alonso pulls alongside the Renault of Jolyon Palmer, he pushes and pushes and eventually makes it stick. A McLaren just overtook something! Räikkönen is back behind Massa again, which will be frustrating for the Finn. Also, Sergio Pérez did a great job/lucked in to move up 11 places into the top ten. Romain Grosjean is reporting a lack of power, the pit wall are checking. Alonso is on a charge, moving past Marcus Ericsson in the Sauber and immediately creating a gap behind him. Both Palmer and Ericsson aren't happy with Alonso's progress and are jinking about behind the McLaren. Palmer gets past Ericsson too, and the Sauber has dropped into the clutches of Kvyat and teammate Wehrlein. 5 second time penalty for Lewis Hamilton - driving unnecessarily slowly in the pit entry. Turn 1 incident involving Lance Stroll and Carlos Sainz will be investigated after the race. A Ferrari radio message suggests the Mercedes pair will swap positions on track - Bottas effectively letting Hamilton past. Hamilton is on the yellow sidewalls, and therefore doesn't have to stop again (but probably will have to). Bottas is on the softer tyre, and Hamilton has reported that he can't catch his teammate anyway. All eyes on Räikkönen again, as he is still following along behind that Williams looking for any opportunity. Runs wide and locks up, drops back. Catches up. Ebbs and flows. Kimi passes Felipe for the second time today. He's off into the distance already. We've missed something going on in the midfield, as Alonso is back behind Palmer again. Palmer passes Daniil Kvyat and Alonso is now looking for an opportunity to pass the Toro Rosso. Team radio from Fernando Alonso: "I've never raced with less power in my life." Kvyat made a move to get past Palmer but the Renault went back in front but not without clipping the rear wing of the Toro Rosso. Some endplate went flying. Despite a lack of power, Alonso is still hustling Kvyat, whose car is spewing brake dust at every corner. Hamilton has caught up to Bottas again, and what looks like an instruction from the team allows Lewis to get past and move into second place. Massa now has a Red Bull in his wing mirrors, with Daniel Ricciardo closing the gap to the Williams. It was a late move for Ricciardo, but he swept to the side of the Williams and moved ahead. Massa tried to get it back but didn't quite have the heart to commit and allows the Red Bull to scamper ahead. Palmer, Kvyat and Alonso are still all wrestling with each other. Team radio to Sebastian Vettel: "Keep your head down, this is an important phase of the race. Stay focused." Palmer and Kvyat bang wheels and Alonso moves alongside the Renault, and eventually outdrags Palmer for 12th place. Valtteri Bottas has made his second pit stop of the afternoon, soft tyres going on the Mercedes. A much better stop from the Mercedes crew that time round, and Bottas returns in seventh place. Five seconds split the race leader Sebastian Vettel from second place Lewis Hamilton. Lest we forget, Hamilton has a five second penalty to be added either at a pit stop or to his time at the end of the race. So whatever he's aiming for, he needs to be five seconds ahead of those behind him. Romain Grosjean takes his second stop, yellow tyres bolted on to see the sole remaining Haas driver to the end of the race. Bottas has the pink Force India of Sergio Pérez in front of him, he needs to get past as soon as he can. There he goes, super quick and easy pass for Bottas to move into sixth place. Sebastian Vettel is pushing hard to create a gap, he needs to come out of his second pit stop ahead of Ricciardo and behind his teammate (who would help him). After complaining about tyres, Vettel dives in to the pit lane. He does it! Vettel squeezes out of the pit lane just in front of Ricciardo, as planned. Behind them, Bottas gets past Massa to move into third place, and he sets the fastest lap of the race so far - 1:34.087. Romain Grosjean passes Wehrlein to move into 13th place, which puts both the Sauber drivers last of the remaining runners. Lewis Hamilton is leading the race now, with Kimi Räikkönen behind him. Vettel has closed up behind his teammate and there's no chance that's going to remain the order for long. There he goes, down the main straight Vettel tootles along past his teammate and moves into second place. Fifteen seconds for Vettel to close the gap to Hamilton. We still don't know if Hamilton has to stop again yet, and there's five seconds hanging over everybody's heads too. Valtteri Bottas is now within a second of Ricciardo's Red Bull. That's fourth place up for grabs for the polesitter. Easily passed the Red Bull, Bottas moves past for fourth. A pit stop for former teammates Sergio Pérez and Nico Hülkenberg in the Force India and Renault respectively. Fastest lap of the race so far for Sebastian Vettel - 1:34.291. Kimi Räikkönen comes into the pit lane after some very angsty radio messages to the team. Vettel has closed the gap to 12 seconds now, with Lewis Hamilton still leading. Team radio to Fernando Alonso: "We're considering Plan B, how are the tyres?" Ricciardo dives into the pit lane for his final stop, no Hamilton ahead of him to block his path this time. Red supersofts going on that Red Bull. Mercedes mechanics are prepping, and Hamilton is getting instructions on the radio, he is coming in for another pit stop soon. In he goes, Hamilton relinquishes the lead to Vettel as he takes his five second penalty and then his pit stop. Bottas has already swept through for second place, and Hamilton rejoins in third ahead of Kimi Räikkönen. Fastest lap of the race so far for Daniel Ricciardo - 1:33.748. Bottas has about ten seconds on Hamilton, but with 14 laps to go, there's plenty of time for Lewis to catch him up. Will he get past naturally, will Mercedes intervene? Hamilton questions why he's been given soft tyres again when there's so few laps remaining, the supersofts would last well. He's told that it's all based on data though. Wehrlein is in 11th place, just outside the points. He's doing a great job, considering its his first full race distance of the year. Teammate Ericsson is down in 14th. Hamilton has slashed the gap to Bottas, just four seconds between the Mercedes teammates now. Tweet from @HaasF1Team: 'This pace is very good, very good lap,' radio message to @RGrosjean from his engineer. P8 - 13 laps to go. One lap later and another two seconds has gone between Hamilton and Bottas. Team radio to Lewis Hamilton: "You've got the pace to win this." Bottas was instructed not to hold up his teammate but the Finn had no choice whatsoever as Hamilton dived to the inside and easily took the position. Vettel is catching backmarkers now, as Hamilton looks to close down the 12 seconds gap to the race leader. He's taken his five second penalty now, so that's the genuine time to beat. The gap's down to ten seconds now, and Hamilton is getting constant motivational messages from the pit wall. Just seven laps to go now. Hamilton now has the traffic ahead of him. He's got two cars to pass, Vettel is coming up on another three backmarkers. Marcus Ericsson has slowed to an absolute crawl, pulls the Sauber off track and comes to a halt. Ericsson reports gearbox failure, and the marshals hurry alongside to recover the Sauber. Vettel makes his way past Alonso and Wehrlein as he clears more backmarkers. And behind him, Hamilton closes up to the rear of that train of cars. Alonso has slowed right down, and is now running off the racing line. It so looked like that car was going to get to the end! Team radio from Fernando Alonso: "Engine problem. Box. Now." And there he goes, the McLaren heads into the pit lane for a disappointing end to a feisty race. Final lap of the race. There's still racing going on with Wehrlein muscling his way through a corner to defend from Daniil Kvyat. Tweet from @svandoorne: Going for a run, you guys up to anything this Sunday? Fireworks erupt above the track as Hamilton and Bottas cross the line for a double Mercedes podium. Grosjean picks up his first points of the season there, and adds to Haas's total. 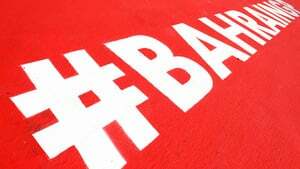 Bahrain's driver of the day has been voted as Sebastian Vettel. All quiet in the pre-podium green room, big smile on Vettel's face of course. Hamilton congratulated Vettel, but he does look disappointed with this result. The national anthems play out. Tweet from @McLarenF1: Tough weekend for the boys without a finish to show for the huge efforts. Thank you to our fans for your support. Podium interview - Sebastian Vettel: "A really great day. Don’t know what to say. The last half of the inlap with the fireworks, I just love what I do. A really great team effort today. Right after the start, I could just feel we were quick. Really tried to put Valtteri under pressure, he didn’t make any mistakes so it was difficult to get near him. But then we went for the undercut… when the safety car came, I thought ‘not again!’ I think it was lucky because the others were just close to the pit lane, so they couldn’t really benefit. I don’t know, I was a bit surprised when I came out ahead of all of them. Apart from that it was good, the car was amazing to drive. It was a pleasure, I could control the pace at the end. Lewis was a bit of a threat at the end, but it was a good race." Podium interview - Lewis Hamilton: "Firstly congratulations to Sebastian, and a big thank you to Valtteri for being a gentleman out there. The pit lane was my fault so apologies to the team. I tried my hardest to catch up, I gave it everything I could but Ferrari did a great job today. We’re going to gather ourselves and come back fighting. Of course the disappointment is there, losing points for our team is definitely painful but it is what it is. All I can say is I gave it everything I could." Podium interview - Valtteri Bottas: "It was really tricky race for me, struggling with the pace all through the race. The first stint we had a bit of an issue with the tyre pressures, every stint after that it was really intermittent. I was just oversteering all through the race and that’s why the pace was slow. It’s a real shame because the target today was a lot higher. I think this was overall the best weekend for me yet with the team but there is much more to come." Another good race for the 2017 season collection. Vettel moves into the lead of the championship and Ferrari have the edge at the moment but the battle with Mercedes is still very much on. Behind the main leaders, Felipe Massa did a solid job to pick up points for Williams, with Force India finishing both cars in the points. Lots of retirements, with the Stroll and Sainz crash that has yet to be investigated. It will be interesting to see what comes out of that one. And of course, the less said about McLaren, the better. Good job by Wehrlein to firstly get to the end of the race, after having previously only run 20 consecutive laps this year. He was 11th, so just outside the points. Two weeks until the next race, which will take place in Russia. Who knows what will happen between now and then, though!